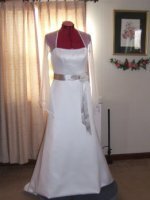 The perfect wedding dress blog keeps you up to date with the "latest in bridal fashion." Learn the secrets of how to choose, find, buy, and alter the wedding dress "best" for your figure. Once you have picked the dress... do you need help with other wedding planning details? Look for those tidbits here on this page. Hey... don't forget to click on the orange button to subscribe to this RSS Feed. So here is what's new.